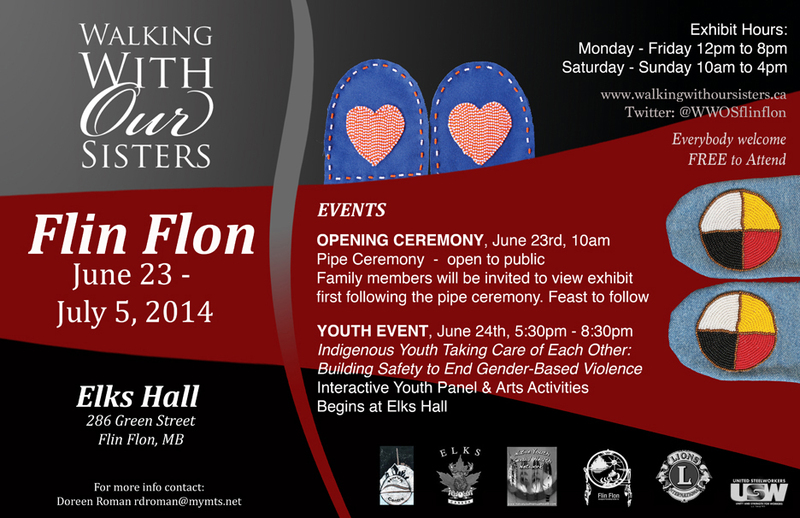 June 23, 2014- (Flin Flon) “Walking With Our Sisters” (WWOS) is a commemorative art installation exhibit to honour missing and murdered Indigenous women and girls. This international touring exhibit opens in Flin Flon today at the Elks Hall. This exhibit is currently scheduled to tour to over 30 locations in the next six years across North America. The art installation is made up of more than1,725 pairs of moccasin tops that have been created by 1372 caring and concerned people from around the world to honour and pay respect to the lives and existence of the missing and murdered Indigenous women and girls across North America. Each pair of moccasin tops represents an Indigenous woman or girl who is missing or murdered. They are not forgotten. They are sisters, mothers, daughters, cousins, grandmothers, aunties, nieces, partners, and friends. They are cared for and they are loved. But they have been taken. This art exhibit will also bring attention to this issue as the numbers of Indigenous women and girls going missing and or being murdered continues to grow. According to the most recent data 1,181 Indigenous women and girls have gone missing or have been murdered in Canada in the past 30 years. It is suspected that the actual numbers of missing and murdered Indigenous women and girls are much higher. In July 2013, Canada’s Premiers backed the call for a national public inquiry into this issue. And earlier this year the Special Parliamentary Committee looking into this issue released their report. It was noted a national public inquiry was not included as part of the recommendations in this report, despite repeated calls for a national public inquiry from those who shared information and experiences with the Special Parliamentary Committee.